Matt Katzenbach, a bizarro Bradley Cooper, poses for photograph with unsuspecting Instagram user at 2016 Sundance Film Festival in Utah. To be a Bradley Cooper doppelgänger is, in and of itself, a pretty sweet gig. Women fawn over you, you can skip a line into any club and you generally carry the aura of a VIP solely on account of hitting the genetic jackpot. It's inevitable that an ego boost of that magnitude will eventually cross a line, however, and that's what's been happening out in Utah during the annual Sundance Film Festival, according to Page Six. Even though Cooper, a Jenkintown native, doesn't have any films at this year's festival, some guy named Matt Katzenbach, who looks a lot like him, managed to sneak into two exclusive parties earlier this week. Page Six originally reported that the then-unidentified Cooper lookalike had finagled his way into a party for the film "White Girl" at Bar 53 and Rock and Reilly's in Park City. Organizers "quickly caught on" and told Katzenbach, "You're done for!" Unable to produce an ID with Cooper's information, Katzenbach flashed the bouncers his cell phone screensaver of a 'Hangover' poster, which did not pass muster. 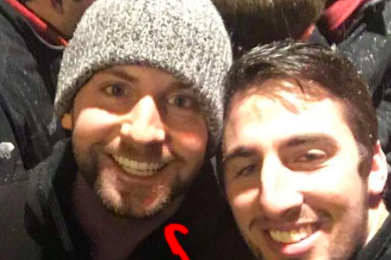 On January 26, visual evidence of the impersonation appeared in the form of an Instagram post by user @seancass10, who thought he was "chillin" with the real Bradley. Days later, a strange twist has emerged. On Saturday, Enstarz published a report containing a video in which Katzenbach claims, having seen all of the previous coverage, that he received "pro tips" on how to realize his potential as "Cradley Booper" at Sundance 2016 (Vanity Fair's original story makes no mention of these alleged pointers). The video below documents Katzenbach's night as the beloved actor, who has not commented publicly on the charade. We can only hope that he'll be asked about it soon and offer his impressions on Katzenbach's ability to act the way he acts when he's not acting.